On the eve of the Olympics-2020 in Tokyo unmanned "minibuses" are tested. 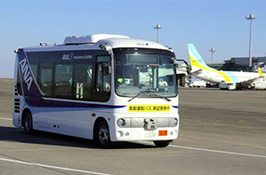 Six Japanese companies, including the national carrier ANA, conducted a joint 10-day experiment using a prototype of an unmanned mini-bus. The vehicle is able to take a maximum of 10 people on Board and runs along the route between the two terminals at speeds of up to 30 kilometers per hour, using a GPS system for navigation, as well as magnetic sensors installed along the entire route. Japan hopes that the 2020 Olympic Games will allow the country to demonstrate many technological achievements to the guests.